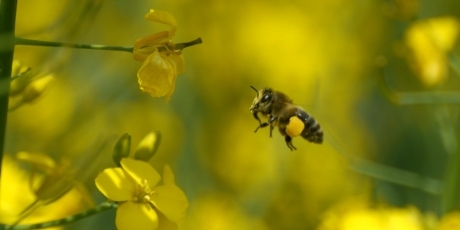 Bee-killing pesticides are banned across Europe, but the UK government is about to allow a giant chemical company to use these poisons on nearly two hundred thousand hectares of British land. The latest science is clear that neonicotinoid pesticides are linked to a catastrophic decline in bee numbers. But chemical giant Syngenta will do anything to undermine the current EU ban, and is pushing an application for 'emergency use' to plant seeds treated with these deadly substances. Our environment minister looks set to say yes to Syngenta's crazy plan, but together we can push him to change his mind. Time is tight -- Paterson must decide before the crops are planted. But after days of negative headlines on Europe, the last thing the government wants is more bad press. If enough of us send messages to Owen Paterson and the Prime Minister demanding Syngenta's application is rejected, we can create a political storm that stops this plan in its tracks. Send a message now!